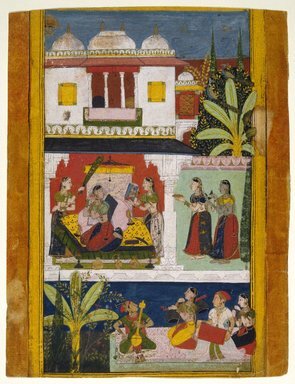 This large-format Ragamala page epitomizes late seventeenth-century Mewar painting. The central scene in the three registers depicted here shows a woman seated on a bed in a two-story pavilion. While one attendant holds a mirror before her and another holds a morcal, she arranges an earring. At the right two more attendants stand right outside the building. The women are all elegantly dressed in saris and jewelry. Below, seen against a deep blue background, are four musicians seated on a pink carpet. (The costumes of two of the musicians possibly have been repainted to represent females.) To the left is a banana tree and a large flowering shrub. In the upper part of the composition, trees and birds are shown against a deep blue sky. To the left is the sun, painted in gold, with a human face.